In a major victory for rhino conservation, South Africa and Mozambique signed a monumental anti-poaching agreement this week, pledging to collaborate to help save the countries' remaining rhinos. According to AFP, the agreement requires the countries to share intelligence and jointly develop anti-poaching technology and education programs for rhinos. 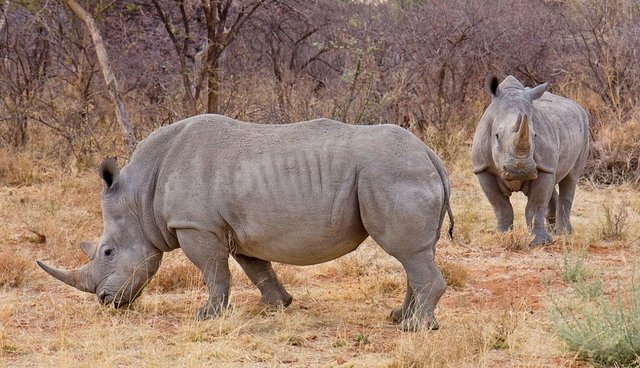 The deal "entails us working together with Mozambique to eradicate rhino poaching... so that Mozambique is not used as a transit country," Environmental Affairs Minister Edna Molewa told AFP. Mozambique early this month approved a law that will impose heavy penalties of up to 12 years on anybody convicted of rhino poaching. "Previous laws did not penalise poaching, but we think this law will discourage Mozambicans who are involved in poaching," Mozambique's Tourism Minister Carvalho Muaria said, referring to a law that will imposed earlier this month to enforce heavy penalties of up to 12 years on convicted poachers. The deal comes not a moment too soon -- this year alone, 293 rhinos have been killed in South Africa, while Mozambique is considered a major hub for rhino horn trafficked to Asia, where it is prized as a traditional medicine.